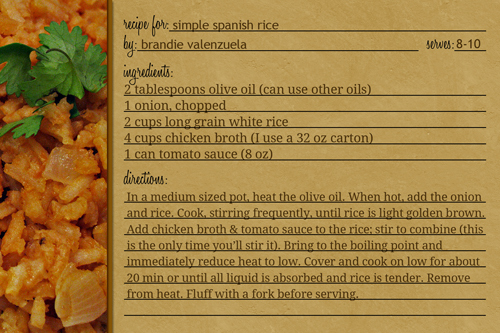 I love to document recipes on digital recipe cards. 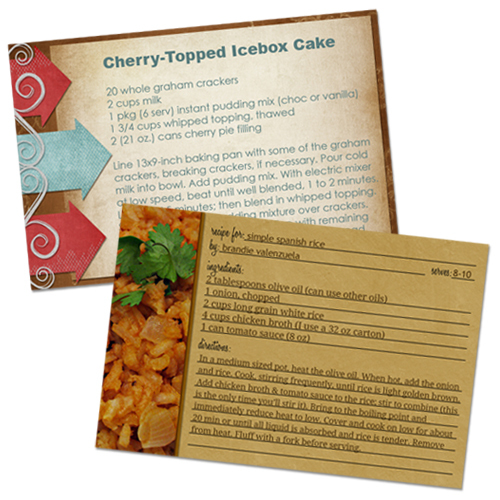 Once you create a recipe card digitally, you can either fill it in on your computer or you can print the card and fill in the recipe by hand. You can also use the card over and over again, just changing out the recipe to create each new card. 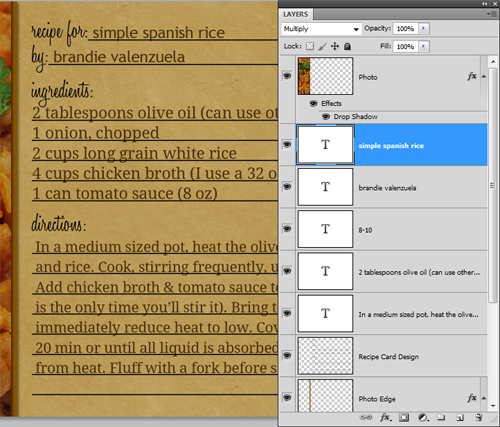 There are many different ways of creating your own recipe cards in Photoshop or Photoshop Elements. My favorite way is by using digital recipe card templates and digital scrapbooking supplies. With templates, most of the design is already done for you and all you have to do is use clipping mask to apply digital scrapbooking papers or your paint bucket to fill with color. But for this tutorial, I wanted to give you some very basic instructions on making your own recipe cards in Photoshop – from scratch. Note: I created this tutorial in Photoshop, but most (and possibly all) steps can be done in Photoshop Elements too. The first step is to create a new document. To do this, go to the top menu bar and click on FILE and then NEW. A new dialog window will open that will allow you to enter the size of the recipe card you would like to create. 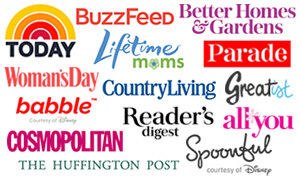 Two most common size of recipe cards are 3×5″ and 4×6″. You could create one of these sizes or another size, if you wish. I like to create my cards at 4×6″, so in the new dialog window, I added the numbers to created a new document sized 6″ wide and 4″ high. I set the resolution at 300 pixels per inch because I will be printing my recipe card and this is what I recommend for recipe cards that you will be printing. If you will only be using and viewing your card online, you could make your resolution 72 pixels per inch. I have a white background, but you could have a transparent background or any other color (it doesn’t matter right now which color you choose). After entering all the information you are happy with it, click OK.
Now you have your new document window sized in the dimensions you set. Next, create a new layer to work on. 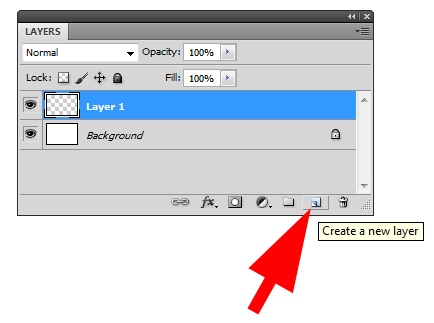 To do this, go to your layers palette and click on the little icon that when you hover over, it will say “Create New Layer”. In the image below you will see where it is. See the blue highlighted line that says “Layer 1”? This is the new layer I created after I clicked that “Create New Layer” icon. Now you are ready to work on your recipe card. You should have this blank space, sized 4×6″ (or whatever size you made it) ready for you to add color, text, or anything else you would like. Begin creating your card anyway you wish. If you’d like to fill your recipe card with one color, use your EYE DROPPER TOOL in the Tools Palette to select any color you like. If you aren’t sure what colors to use, there are many online color palette creators available online. You can simple upload a photo of your completed recipe or another photo you like and it will generate colors for you. One site for doing this is Big Huge Labs Color Palette Generator. After it creates the palette for you, you can save it an ASE file which can allow your colors to be easily placed in your SWATCHES palette (usually located on near the right of your Photoshop screen). 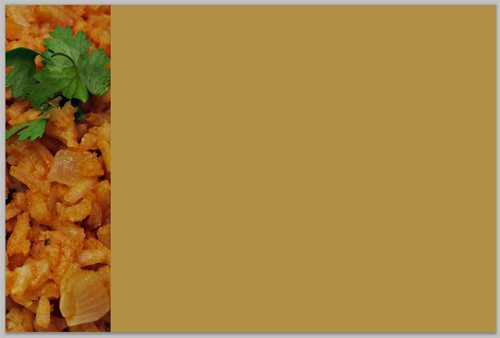 I’m creating my recipe card for my Spanish Rice recipe, so using the Color Palette Generator, I uploaded a photo of my Spanish Rice and I was able to have a selections of colors generated for me (the colors it created are shown mostly in the bottom rows of my swatches in the image below). I will then use the EYE DROPPER TOOL to pick (click on) one of the colors from the SWATCHES palette. After you pick a color you would like to use, you are ready to fill your recipe card with that color. In your Tools Palette, select the PAINT BUCKET TOOL. After doing that, your mouse pointer will turn to a little paint bucket. Just click anywhere on your new recipe card to fill it with the color you chose. 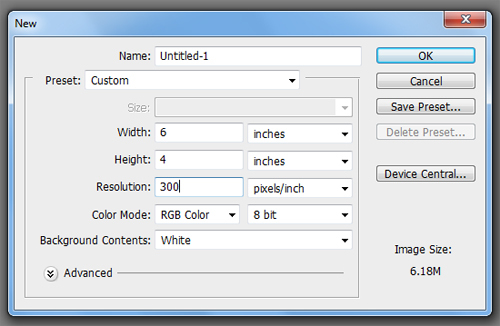 At this point, you can add photos, text, embellishments, clipart, or textures. 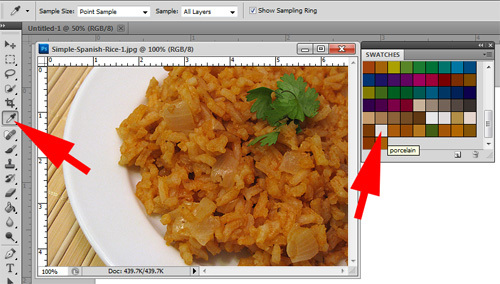 If you wish to add a photo, open your photo in Photoshop, click on the photo and drag it over to your recipe card. 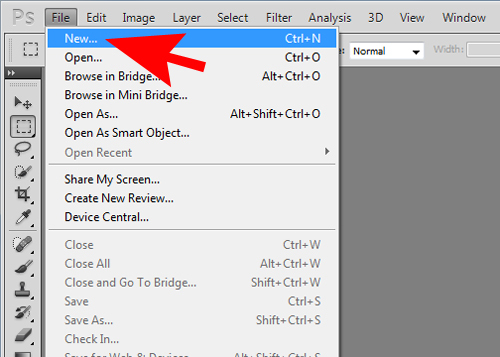 From there, you can resize the photo (go to EDIT –> FREE TRANSFORM and while holding SHIFT key, click near the corners and drag inward or outward to resize). If you want an easy way to add the recipe card lines and other details, you can use digital recipe card brushes, such as this set that I’ve created here: ScrapHappy Brushes Midi: Recipe Cards 1. I use these for most of my cards – you just load them in Photoshop or Photoshop Elements and digitally “stamp” them onto your recipe card. These are one my favorite time-saving thing to use, but they are optional. You don’t have to have lines or the standard recipe card text on your card or you can create your own, if you wish. When you are ready to add your recipe and other text to your card, select your HORIZONTAL TYPE TOOL in your Tools Palette. 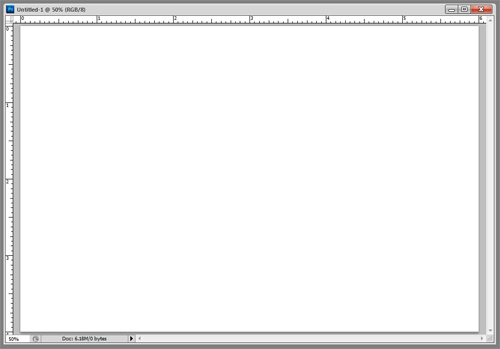 After you select the TYPE TOOL, go to the top of your Photoshop program and you will now see the TYPE TOOL menu bar. From here, you can change the font by clicking the drop down menu and you can also change the font size, as well as do several other things. Pick a font and size that will work for your card. You will also want to select a color to type in and you can do this similar to the same way you chose a color before – with your TYPE TOOL selected still, go to your SWATCHES and select a color to use. Click your mouse onto your recipe card where you would like to type the recipe title. Start typing in your recipe title. 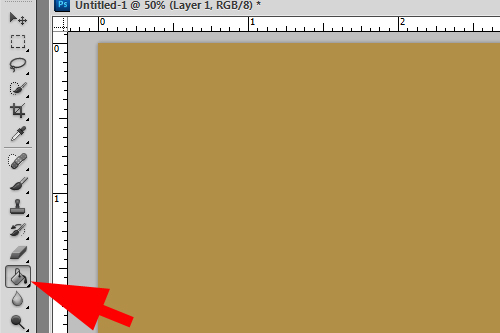 When you are finish, click once on the type layer in the Layers Palette to have Photoshop accept your text. This will change your text layer name name from something generic like “Layer 1” to the words you just typed. Repeat with the other areas of your recipe card. When you are finished with your card, save it as a PSD file for safe keeping — just in case you need to edit the text later or make other changes. 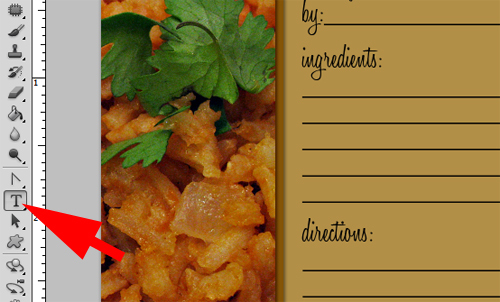 If you plan to print your recipe card or use it on the web anywhere, save it as a JPEG file too. I hope this inspires you to give digital recipe cards a try. If you have any questions, leave me a comment and I’ll do my best to help. 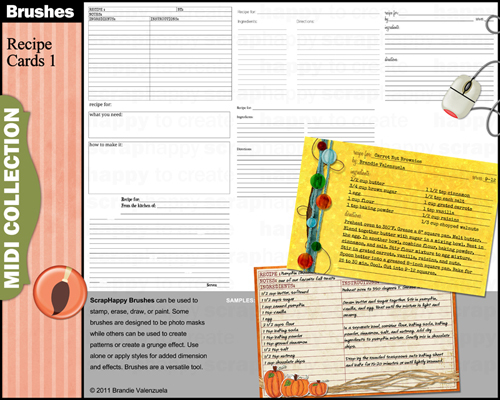 Supplies used in the recipe cards above are available at Happy To Create.